Which side is wrong? Is it President Trump for saying that the leftwing media is the enemy of the people for telling lies, smearing Republicans, propagandizing fake news, and covering up Democrat crimes? Or is it the leftwing media for saying that President Trump is a dictator declaring the ‘free press is the enemy of the state,’ that he is a traitor who should be assassinated, that the police are racists who should be murdered, and that the people who vote Republican are anti-American? Once again, we are not dealing with rocket science. What is being said is out in the public square on an open forum to which all the people bear witness. What is being done is that Democrats and their leftwing media propagandists are being exposed, mostly by rightwing media, so that people are not ignorant of actual events and the true facts. Leftwing media people say it’s not them saying Trump should be assassinated or that police are racists. They are just reporting it. But when you report lies as if they are facts you are not, in fact, just reporting events. Journalism has not been practiced in America in decades. The left had a monopoly on information until Reagan undid their restrictive laws and conservative radio and television were born. Now they are up against others who disagree with how the left reports events. They can no longer color events as they please in their attempts to shape people’s opinions. Just because some radical leftist socialist declares Republicans to be the KKK that was created by Democrats does not make it so. Reporting this as a fact just because some liar said it does not make it true, only true that he said it. Leftists always report lies as facts. Everything that happens in government is always portrayed by leftwing media as evil when Republicans are doing it, even if it’s the same thing that Democrats did, such as separating children from detainees who illegally cross the border. When left-wingers report it, they say that Trump is taking children from all immigrants who cross the border. When they report on illegal immigrants invading the country they always refer to them as immigrants as if they did so legally. This is the kind of lie that leftist media believes they can tell with impunity. If the Republicans cut the budget it is always reported that they are taking food out of the mouths of children and leaving old people to die in the streets. Whereas when Democrat do it they always portray it as benevolent and beneficial even when they raise taxes to steal more wealth from the people. When Democrat racists rant against white people they are portrayed as justified in righteous wrath because Republicans are portrayed as racists, when they are, in fact, expressing their own racism against people who are innocent of bigotry. The bigotry of the left is exemplified in the New York Times editorial board hiring an editor who is an Asian racist who hates white men and proudly says so. They say, “minorities cannot be racist,” as if that’s a real thing. This two-faced bigotry by the left falls on its face in the eyes of morally righteous Americans. They constantly make excuses for leftist Democrats instituting hateful, racist activities, and even condone criminal actions such as those committed by Obama’s black shirts of Antifa and BLM. The ideological opposites are starkly visible in America today. The righteous like Trump lead by example and make the country better for all Americans. The Left uses force to coerce people to obey them so they can rule over the masses. The goals of each are simple when the facts are examined. Leftists say Trump will only benefit the rich, but that lie falls on its face in the shadow of Trump’s economic boom. The left claims there is no boom, while at the same time saying they would like to hurt Trump by creating an economic collapse. So, what does voting for Republicans actually get you? Republicanism; capitalism, Americanism, strong law-enforcement, strong borders, a stronger military, lower taxes, less government restrictions, more jobs, more opportunities, and liberty. What does voting for Democrats actually get you? 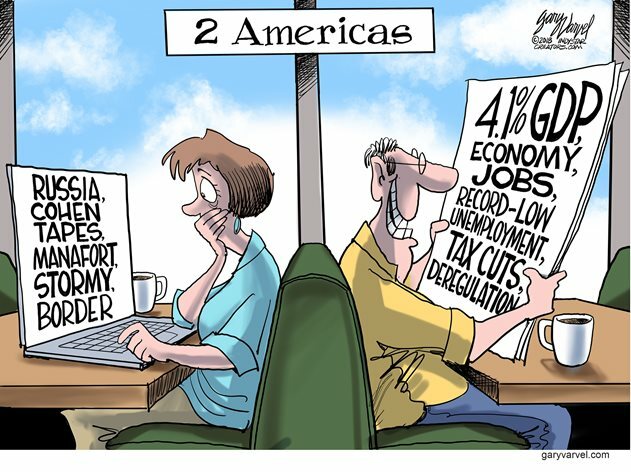 Democratic socialism; high taxes, fewer jobs, more government welfare, open borders, importing illegal invaders, government strangling business, a war on law enforcement, and less freedoms. President Trump is fighting the swamp rats in Washington to make the country secure for its citizens. Leftist Democrats and their RINO allies want the borders to remain open for their cheap labor, drugs, and illegal voters. They know that Trump is turning the nation around away from Obamaism managing the nation’s decline to make America great once again. The party of Reagan and Gingrich is being renewed along with economic hope and prosperity that democratic socialists abhor – except when they get the chance to steal wealth from it. Leftists keep promising Utopia under socialism that has delivered nothing but misery and death everywhere it has been tried. The left says they want democratic socialism instituted under the right people for the “benefit” of America. It was instituted by Obama, who they called “The One,” and who went the whole nine yards to follow the socialist models of the 20th century taking wealth, strangling business, and promoting elites – right down to forming his army of agitators to riot, assassinate, and intimidate the people. Republicans are afraid to express their support for Trump for fear of being attacked by liberals, have their food spit in, or their cars keyed. Democrats justify these attacks by damning police for shooting criminals. The only Democrats who say they are afraid of Republicans are those who went out in public calling for their rabid lemmings to attack innocent people. What they need is to be thrown in prison for inciting violence and sedition! Let’s pray that Sessions will get off his thumb and start taking actions after Republicans win big in the 2018 midterms, or that Trump replaces him someone like Trey Gowdy who is unafraid of draining the swamp.